My wall-hanging made with Hoffman Bali Tiles was finished a few days ago but I've been slow to take pictures. It turned out really lovely, if I may say so. The colours in the batiks are so soothing. It's made with a panel of 4 Bali Tiles which were fussy cut in a circle and machine appliquéd onto the background. If you are familiar with how I work, you know that I looked for a super-simple way to turn the edge of the fabric for the circle, and found it! This is actually the first time I have used this method and it was so effortless that it will be my go-to method henceforth. There is no gathering thread involved and no freezer paper/starch or gluestick in sight. All machine done and quick-as-a-wink! The project measures "19 x 55" and I added tabs at the top for hanging, but what a gorgeous bed runner this would make with a couple of more tiles added. For fun, I stitched a little cushion to match. 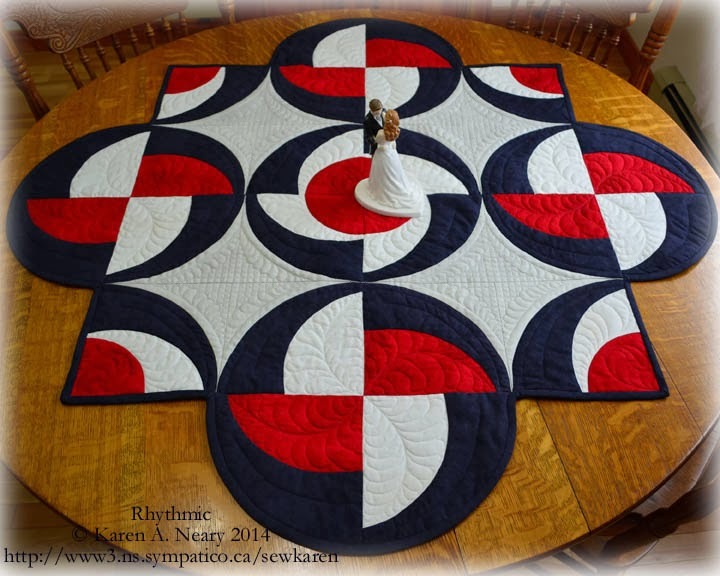 The quilting is all straight line, with rays coming from the circles and straight lines horizontally in the border, like piano keys. Sometimes less is more, as you want your eye to go to the beautiful tile not the quilting. The Bali Tiles are available at Mrs. Pugsley's Emporium in three colourways: Sea Holly (that's what I used), Volcano and Splash. The pattern is finished up and ready to go. You can purchase it from my website or from your favourite fabric shop for $10.95. Please come back in a day or so as I have a little Valentine project to share with you! 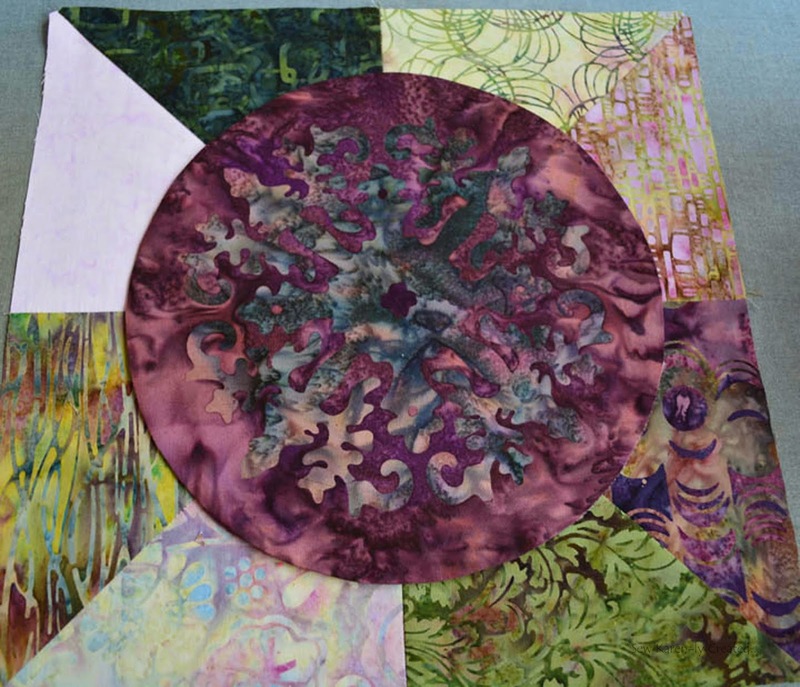 Over the weekend I sewed Hoffman batiks - their bali tiles to be specific. Gorgeous, gorgeous, GORGEOUS fabric. I'll show you the whole thing once I finish quilting. Since it seems most of my work the past couple of years has involved curvy, borderless quilts it's been awhile since I added a mitred border. 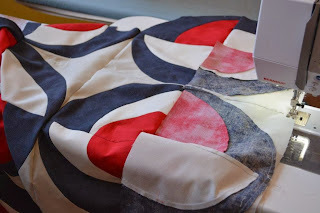 I confess that I enjoyed it a great deal (I really love to sew; even after all these years, the challenges of patchwork excite me!) Sewing the mitre was like riding a bicycle, I guess; once you get the rhythm you are off at top speed. One trick I've figured out is that if you are adding multiple borders, it's easier if you sew the strips together first and add them as one border instead of individually. 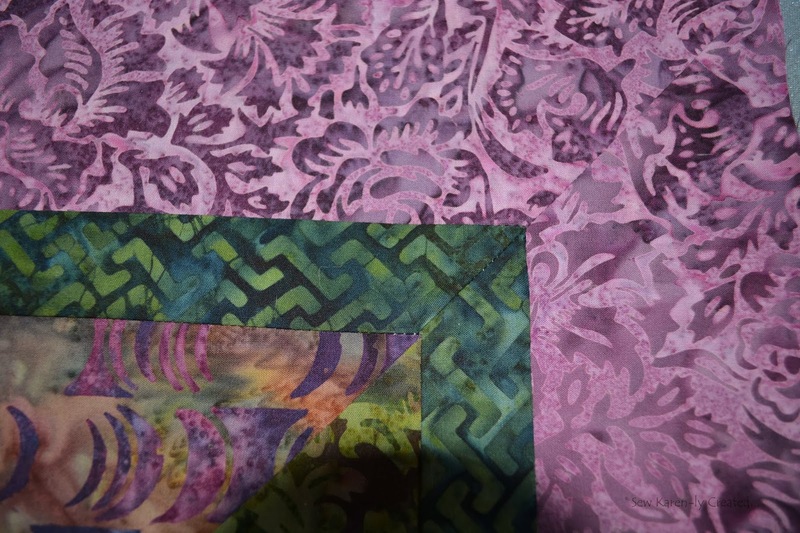 Here I have sewn the green and mauve strips together before sewing them to the quilt. Each strip is sewn to within 1/4" of the corner and left hanging. 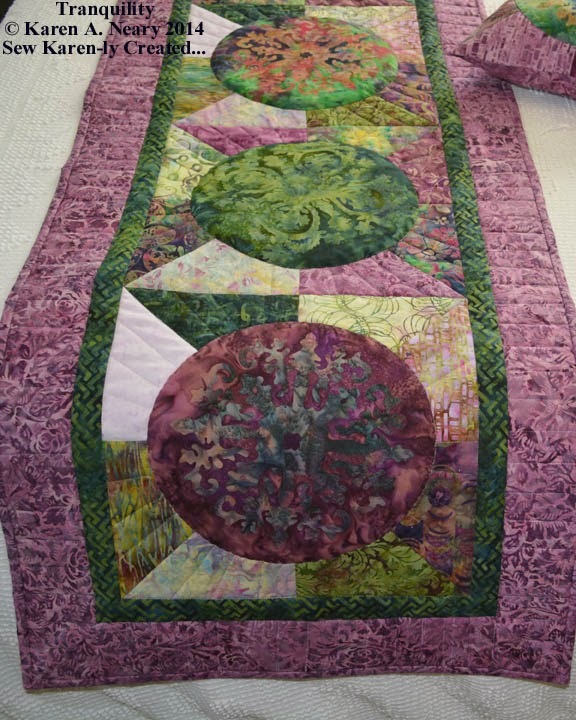 The seam allowances are pressed away from the quilt, towards the border. One strip is smoothed out on top of the other. Fold the top strip on a 45° angle, lining up the top and bottom of the strip with the one underneath. Bring your hot iron straight down on the corner and press well. I usually give it a shot of steam too once I have the iron solidly in place. You want to make a visible crease in the fabric. Once pressed, pin the strips together to the right of the corner so that nothing moves. If you look closely you will see two white pins in the photo below. Flip your quilt up on a 45° angle; you will see the crease you pressed. 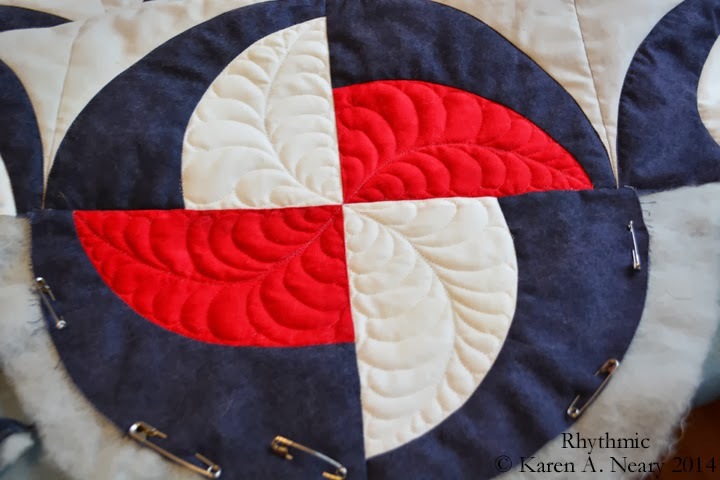 Pin along the crease; this will become your sewing line. Sew straight out from the inner green corner to the outer border. 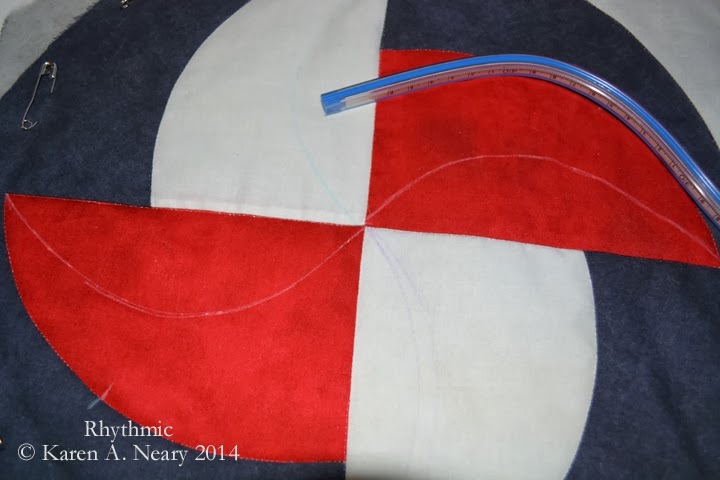 Trim your seam to 1/4" and press this seam open so your corner lies flat. This gives you a nice sharp, smooth join. 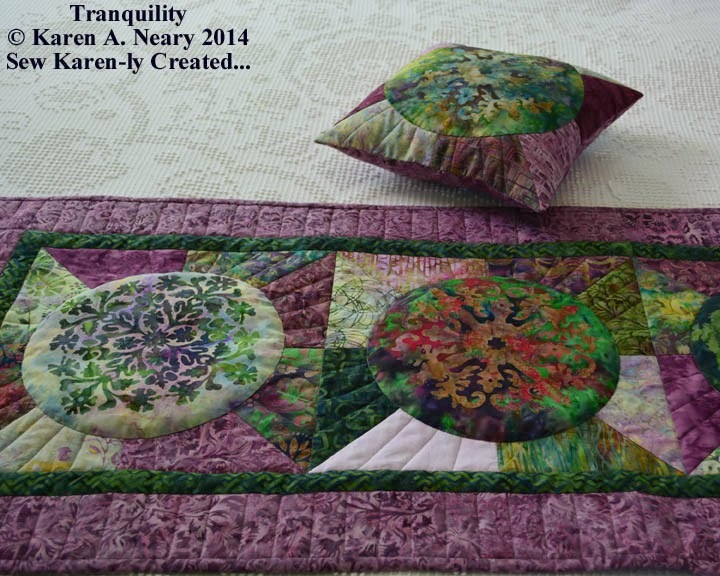 Now I am off to quilt this beauty! 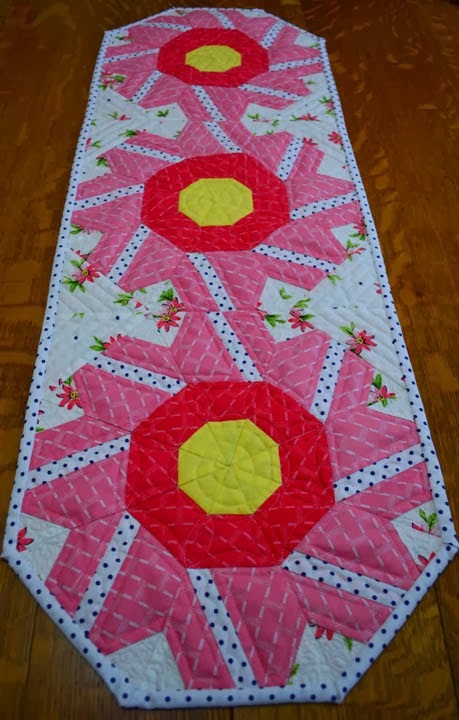 During yesterday's blizzard, I finished up the quilting on the new table runner and - thanks to Kate from Arts and Socks - it finally has a name: Polly's Posies. 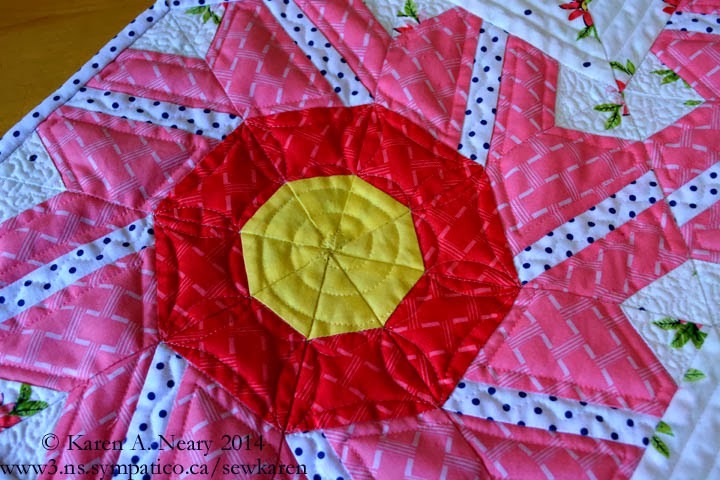 It's a cheerful project and one which did not take a great deal of time and effort - or fabric. The collection I used is Michael Miller's "Cottage Path." 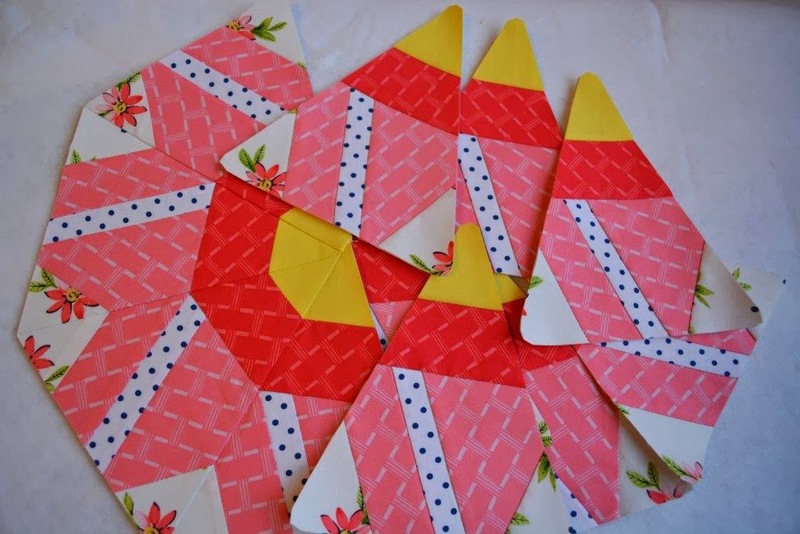 The pattern also includes instructions to make matching placemats. 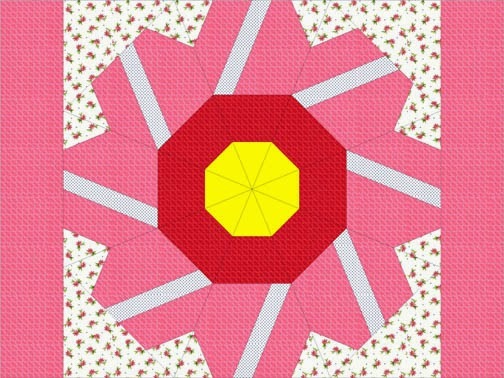 The block would make a terrific pattern for a bed quilt pieced in a variety of colourful scraps. 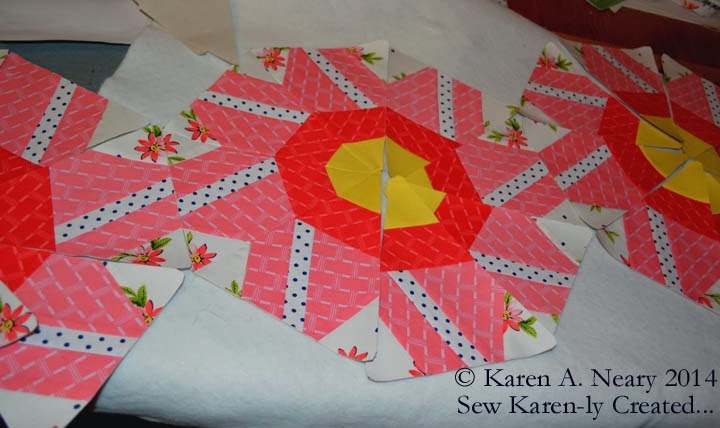 The quilting was kept very simple: outlines on the petals, stippling in the corners, squiggles in the polka dot strips, and a big swirl in the centre. Polly's Posies measures 12" x 36". 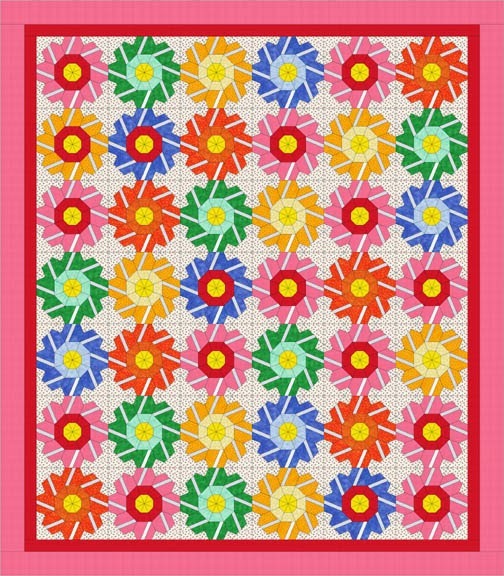 The pattern is available for purchase as an instant download here on Craftsy for $4.00. Some folks are full of good works and Bernice McMaster is one of them. Even though she keeps herself very busy with volunteer work she makes sure she always has time to sew. This is Bernice's version of Oriental Beauty which she started in a workshop I did in Sackville, NB last spring. I recall that Bernice agonized over her colour choices, but what a striking blue she chose as accent. 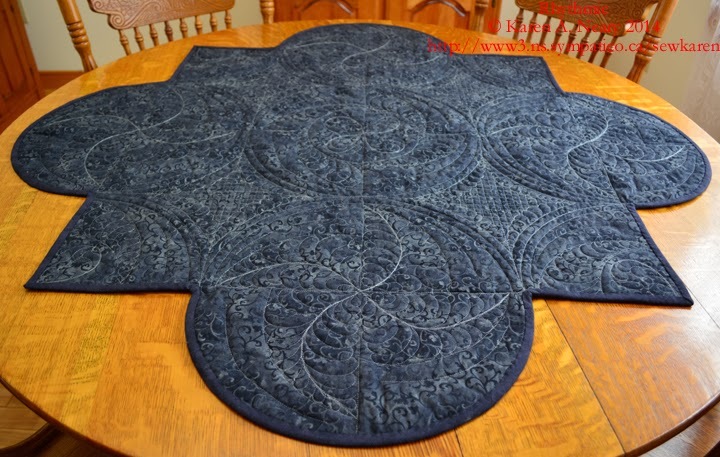 Bernice writes that this piece looked so good on her kitchen table that she made curtains to match out of the darker blue fabric. The pattern for Oriental Beauty may be found on my website. Bernice has coordinated a group of Upper Sackville, N.B. women who meet at her house weekly to sew "little dresses for Africa". Bernice writes, "We found a teacher who is going to Uganda next month so she will take a duffle bag of 35 with her to be distributed to children in need. Then we just look for missionaries who are going to any country in need and send them. If you know of anyone who is spring cleaning and has elastic, rickrack, lace and bias binding that they no longer want we would be so happy to receive it! Bias binding and elastic are the hardest to obtain." If you are local and would like to help out Bernice's group, kindly email me and I will put you in touch with Bernice. Lastly is this picture of one of two pot holders Bernice made and donated to the IODE bazaar in the fall. Bernice acts as co-regent of her IODE group. The directions for this little project may be found here on my blog. The blocks are pieced and I am joining the sections together. This is the fun part - fitting the sections together like a jigsaw puzzle and envisioning the whole. So much potential! As I work, I am trying to name this bright, flowery new baby. Any suggestions? My favourite Steve Winwood song is playing in the background and I am flipping back and forth from one project to the next as the muse directs. It's been a very creative month and I am letting it flow. 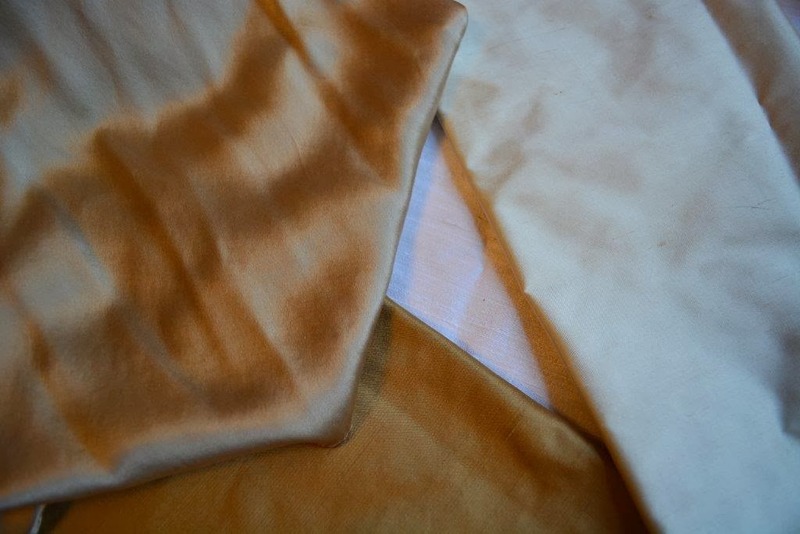 I have a commission for another antependium - a wedding one - so I picked up some silks on a recent trip to Moncton. Classed as a "special day" in the church calendar, the parament will be predominantly white. I chose a dupioni silk for the background, and champagne and gold dupioni and habitai silks for the elements. The basic design is sketched out but I haven't decided yet whether to piece or appliqué it, so while that perks I drew out a couple of small projects which were in my head. I am using up fabrics left over from the book projects; this is the Cottage Lane collection from Michael Miller. It's going together very quickly so unless I get distracted and start something else (!) it should be finished up in a day or two. Lynn shared some pictures of a class she taught on my Selvedge Tote pattern at the Covered Bridge Quiltery in Moncton, New Brunswick. 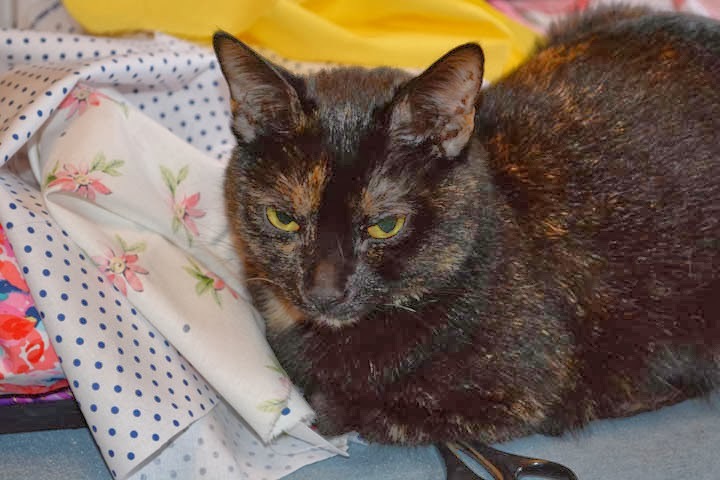 Lynn writes: Yesterday the "Sew and Sews" sewed up a storm at Martha's. It was fun. Some of the members brought in their completed selvage bags from last month. There are still several to come in...Note the embellishment on Donna Thurber's project. Love those yo-yo's, Donna! Thank you Lynn, for sharing these pictures. You can purchase the pattern for this tote on the checkout of my website; it includes directions for a matching gadget bag as well (I use mine for my phone). Here's a picture shared by Lori S from Dauphin, Manitoba of her Winter Star Mug Mat. I love the background in her photo - I first thought she had them spread out on coffee beans! Thanks so much for sharing, Lori. Having visited the beautiful city of Dauphin during the winter in past years, I expect a cup of something hot is very welcome in January! If you'd like to make your own Winter Star Mug Mat, the pattern is available as a free download here. The quilt I showed you a couple of days ago is all finished, and I am pleased with how it has turned out. I hope you like it too. As it usually does, the design started with the fabric, from the Shadow Collection by Stof of Denmark. I used red, black, creamy white, and a soft grey. I love how the fabrics look together - so clean and crisp. Naturally, I went with curved seams and the piece has a great deal of movement. 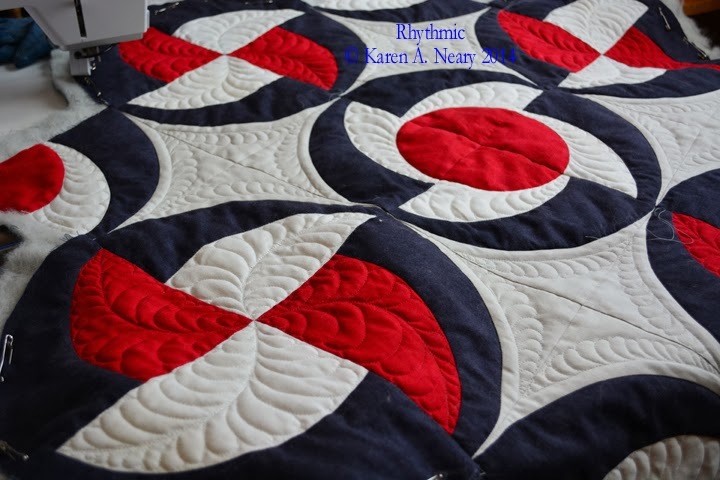 The blades appear to spin like fans so I chose a quilting design to enhance the effect. My flexible ruler came in handy to mark a spinning line in the coloured patches. This is all the marking I did, using the edges of the block as my boundary for the feathers. 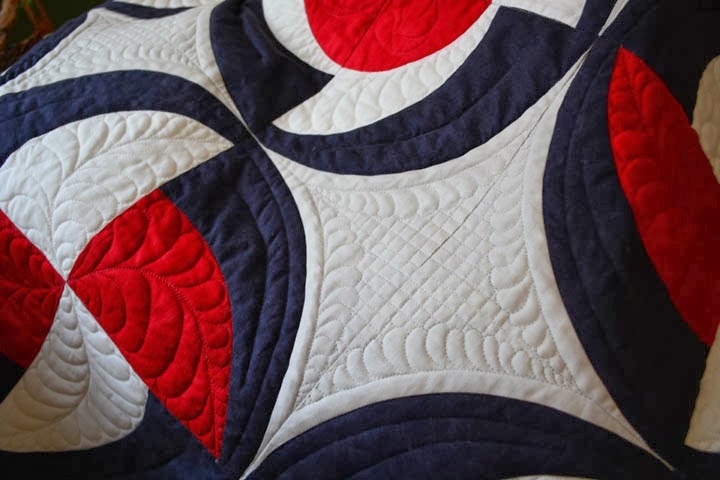 Because it was all free hand, the quilting took no time. I started around 8 am yesterday and was all done by my 1 pm lunch break. I used Invisifil thread top and bottom, in matching shades of cream, red and black and my favourite wool batting. In the intersections between the blocks, I did a small feather along the curved edges and added a grid filler in the centre. On the back is a pretty mottled charcoal grey. The pattern is available in two formats: a traditional printed version available from my website, or as an instant download through Craftsy (direct link). The patterns will also be available at Mrs. Pugsley's Emporium, along with the beautiful Stof fabric from which it is made. ...and new beginnings. I was happy to turn the calendar page from 2013. The year begins with renewed opportunities for personal and professional growth and my head is full of designs which I've been drawing out as fast as I can in Electric Quilt 7. 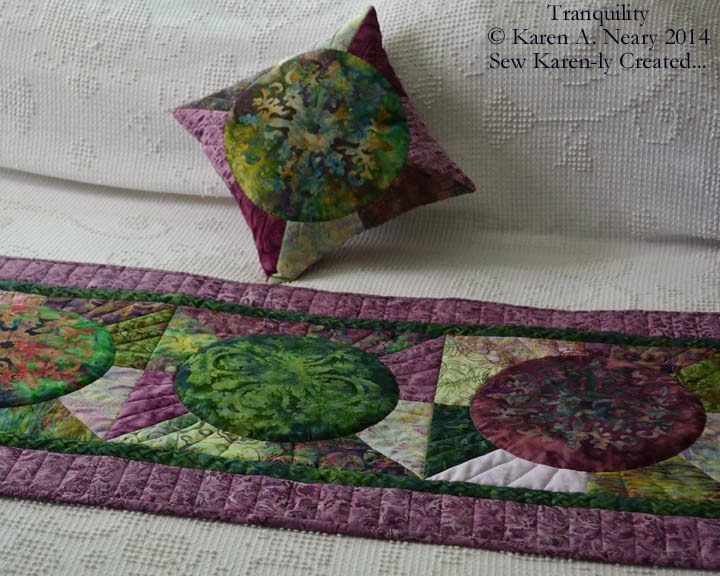 The quilt shown is called "Rhythmic" and it has awesome flow and movement for such a small piece...and a very unusual shape. I like it a lot. The top is finished and now I will work away at the piecing diagrams and instructions while I ponder how to quilt it. I'll show you soon! Best wishes to all for a happy and productive 2014.